Ableton has accustomed a lot of us to the idea of having a grid of bits of ideas we can trigger and layer (among other similar metaphors in drum machines and the like). So of course that same functionality would make sense elsewhere. 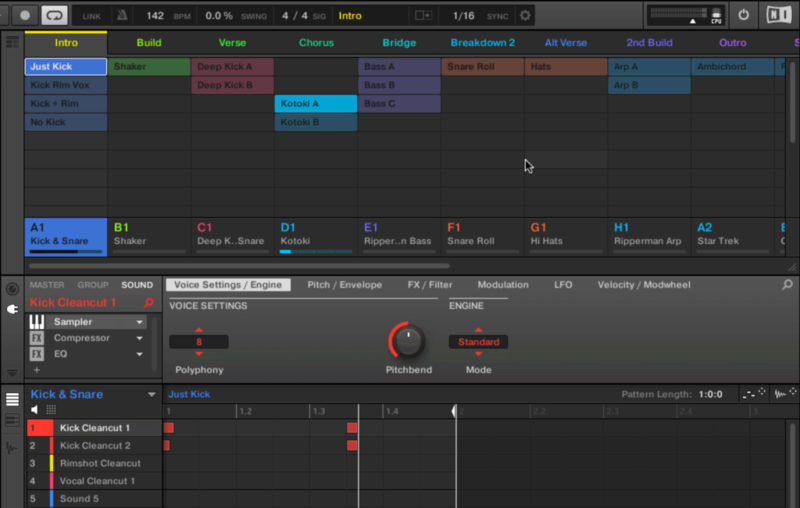 Maschine Jam took Native Instruments’ groove workstation into a different direction by focusing on how you generate, transform, and arrange ideas. Now that focus on workflow is finding its way into the whole Maschine family, both in the form of refinements to Jam and new functionalities elsewhere. Scenes and Patterns can be created and combined in this view without affecting the current arrangement. Select the Scene to edit by clicking a Scene button at the top of the grid, then click Patterns in the grid to assign them to the Scene (assigned Patterns are brightly lit). To un-assign an assigned Pattern, simply click on it. To create new Patterns in this view, double-click in an empty grid cell. You can swap between Ideas and Arranger Views using shortcuts, too (CMD+1 / CMD+2). On the Jam controller, you’ll see the Ideas and Arrangers views on the whole 8×8 grid, building on how Jam already worked. On the other (4×4) controllers, you can use the Navigate screen or toggle via SHIFT+SCENE. Also new in this release, it’s easier to manage routings. The “+Routing” button that now lives in the Group Browser loads any audio and MIDI routings together with the group. Or you can disable that, and user and audio routings you’ve set always stay the same. The upshot of this is, you can now make Maschine more useful for work with hardware, whether it’s more convenient to choose one set of routings and keep them, or toggle between different routings using groups for managing more complex scenarios / performances. There are loads of details to how the Ideas view works, plus tons of fixes and tweaks packed into this release.